Published in the South Kent Gazette, 27 August, 1980. The Norman Keep, for which we are indebted to Henry II and his master builders Fitz-Helto and Enemenda stands 343ft. above sea level, the altitude of the highest turret being 469ft. This Keep, with the walls and towers surrounding it, forms the inner ward of the Castle, approached by two gates—King’s gate on the north-east, and Palace gate on the south. The middle ward, now imperfect, consisted of the Roman and Saxon works; and the outer ward, still complete, consists of the outer wall, which encloses the whole hilltop, around which there are 27 towers. Some of the towers in the outer ward existed from the early part of the Norman period; but the completion of the wall and towers of the outer ward was the work of Hubert de Burgh, between the years 1220 and 1239, after the unsuccessful siege by the Dauphin of Prance. The Constable’s tower Is in the outer ward, but when it was built is uncertain. It is one of the finest gateways in England, and tradition says it was built on the site of art older gateway by John de Fiennes, who was appointed Constable during the life of William the Conqueror. In addition to the scheme of defence which comprises the three wards, the Castle Hill has been extensively and permanently mined in the solid chalk. In addition to ancient subterranean chambers near the cliff face, believed to have been originally dug out by the ancient Britons, there are a great many subterranean ways intersecting each other, some opening into shafts connected with the surface of the interior, and others getting light and air from openings to ditches and the face of the cliff. The northern part of the underground work was devised by Hubert de Burgh, after the French siege, in order to make a sally or retreat from the spur, which he then constructed on the north of the Castle. About a hundred years ago the spur was altered and extended. There are no records left of battles and sieges in Roman and Saxon times. When the Conqueror advanced in force from Hastings the Castle was given up without a light. A year later the men of Kent, with the aid of Eustace, Earl of Boulogne, made an attempt to retake the Castle, but in a fight, which took place on the space between the Saxon works and the clift, the Norman garrison vanquished the men of Kent, many of whom were driven over the cliff and killed. During the reign of Stephen, the Castle is said to have been twice taken—once by Queen Maud, for her husband, King Stephen, and once by the adherents of the Empress Maud; but treachery more than prowess is supposed to have prevailed on those occasions. 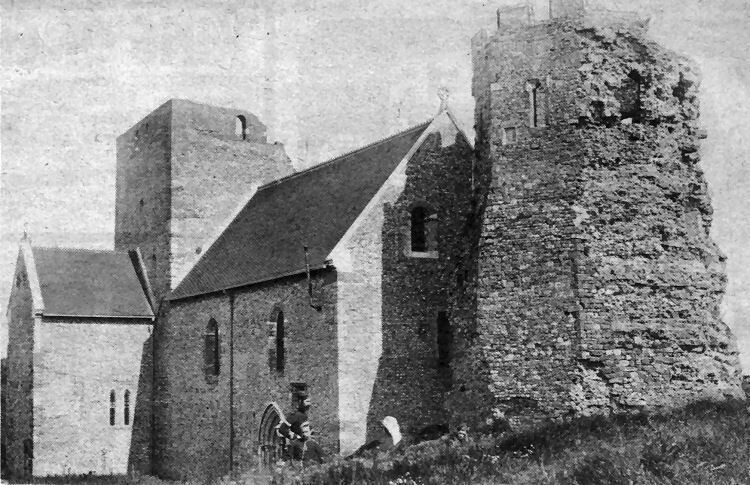 A late 19th century photograph of the church of St. Mary-in-the-Castle with the tower only partly restored. 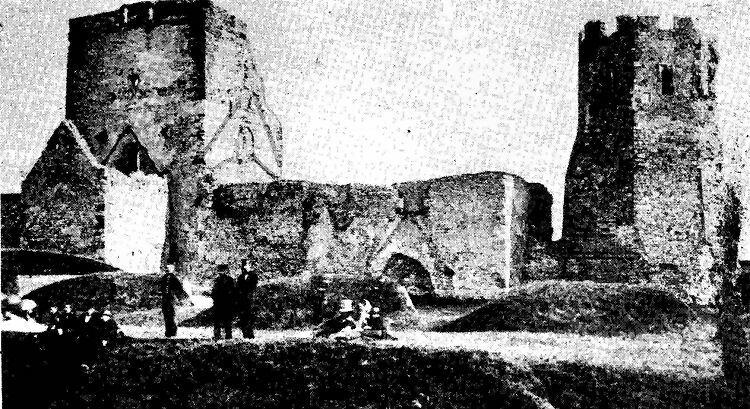 Considerable restoration work had been carried out on the church as a whole as can be seen by comparing this pictured with the one below which is probably the earliest known photograph of the church and Pharos. The newspaper transcript, below, from the Dover Telegraph of 4th April, 1857, shows how close the church came to being demolished after many years of neglect and degradation. TO THE EDITOR OF THE DOVER TELEGRAPH. Above photo is probably the earliest known one of the Pharos and Church.